It is very important for any website to find out who are currently login into our syste or who are online. Because it will increase the value of website into another user who has online to system. This type of feature most we have seen in social media or forum site. 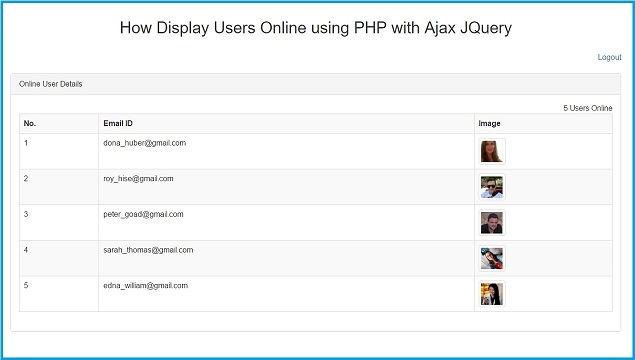 So in this post we have discuss topic like display user information who are currently login into our website by using simple PHP Script Mysql database with Ajax JQuery. If you are using internet and you have already seen on many website in which we can seen the number of online users. So displaying online user details may create nice image on the new visitors of websites. For create this type of feature there are following steps to create this type of feature. First when user has login into our system then we have to save his login information like his id, login time into our login details database. When login into our system by entering correct login details then after we have create one SESSION variable login id in which we have store the id of login details id based on this id we can update his last activity table column data with current time stamp. After storing user login information in table and generate one unique login id and store into SESSION variable, so we can access this variable value into accros our system. So when user logged into system after this we will update current time stamp into his last activity table column into login details based on the unique value of login id get from SESSION variable. For update time stamp data on every three second we have use Ajax with JQuery. For update last activity data we have make one jquery function and in that function we have use Ajax request which send request to server for update login user last activity data and by using JQuery setInterval method we have called this function on every three seconds. So this way we have update login user last activity data with current time stamp data by using Ajax JQuer with PHP Sever script. Now We have already discuss how logged in user data insert into login details details table and how we have update that login used login details every three seconds, now we have move to master user login. This master user can view who is currently logged into our website. So for this we have make one jquery function and in this function we have use Ajax request which send request to PHP server script for fetch data from login details table and here we have condition like it fetch only that data whose last activity table column data is current time stamp data minus five second. That means it only fetch that user data whose last activity time stamp data less than of current time stamp minus five. So this query will return only that user data who currently online with our system or use our system. After fetching this data we have use setInterval() method, by using this method we have called this jquery function on every three second. So on every three second it will display live online user data on web page. So this is simple system in which we have discuss topic like how to display online information by using PHP PDO with Ajax JQuery and Mysql.